It’s that time of year again! The Warner Theatre’s 13th Annual Holiday Wine & Food Tasting! 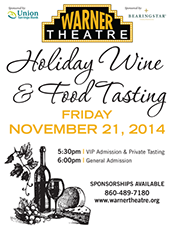 Come join Angelini Wine on November 21st for their 13th annual holiday wine and food tasting! This wine tasting fundraiser will benefit the Warner Theatre which is a non profit organization. This wine tasting is made possible by one of the many sponsors for this event.. Tony’s Drive in Package Store. This wonderful evening will feature hors d’oeuvres, desserts, a live jazz trio, and the star of the evening.. the private wine tasting! including multiple high end wines from international and domestic wineries. This year they also have a small batch bourbon table along with a VIP reception area.